Ale Industries is one of the closest breweries to where we live, so I wish we really loved their beers! 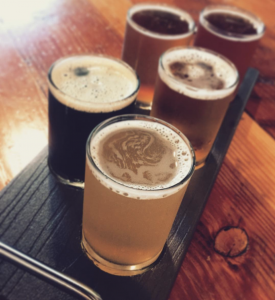 So far, the fella and I haven’t been blown away by anything they make, but their brewery is a good hangout spot, especially on weeknights after work, since it’s right by the Fruitvale BART station. 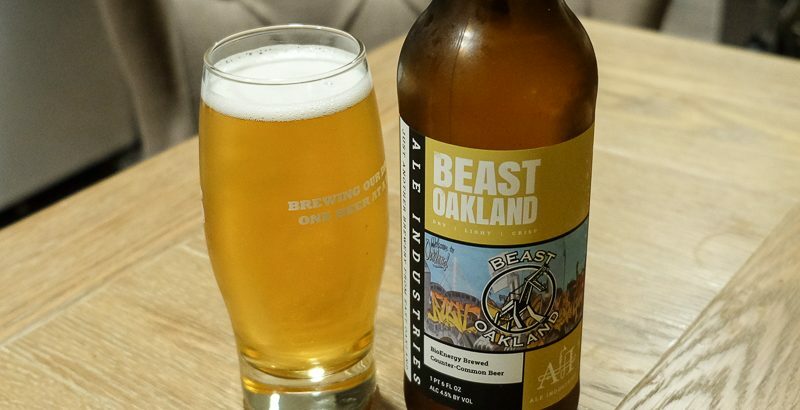 Beast Oakland is a Kölsch, and it’s one of my go-to beers at AI. On Thursdays at the brewery, bottles are 50% off if you buy two or more, so we brought home a couple of these. It’s clean and crisp, and a good option when you just want to enjoy a beer, but don’t want anything high-gravity or terribly fancy. It’s a beer to drink while watching sportzball, which makes sense, since the name comes from an Oakland Raiders player. I like that Ale Industries uses Oaklandish things in their names and on their labels. They also make an IPA called East Bay which features the BART map on the label. 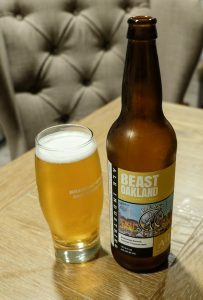 Overall, Beast Oakland gets 3.75 stars from me and 3.5 from the fella. We actually both upgraded our ratings by a quarter star after our initial visit, when we only had a flight, so I recommend enjoying a larger pour of this one and drinking it nice and cold.